The Representation Office of North and East Syria in Benelux would like to give a notice on the launch of the new coat of arms of the Self-Administration officially implemented last month by the General Assembly of North and East Syria as a part of the ongoing evolution of the Self-Adminitration. The new coat of arms was approved and adopted by the General Assembly during their bimonthly meeting last month in the city of Ain Issa. 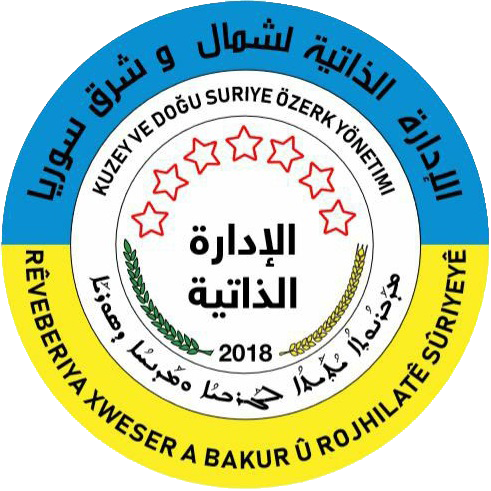 The center of the logo has a semicircular green olive branch on the left, a semicircular yellow wheat spike on the right, and seven red stars symbolizing the regions of the Self-Administration. The new logo is written in four languages (Kurdish, Arabic, Syriac, and Turkmen). The use of colour ‘blue’ indicates the Euphrates, while the ‘yellow’ indicates the permanent spring. The Self-Administration refreshed the coat of arms to reflect who it is today and to symbolise the future of the peoples of the region. The new design will start to appear on our website and other materials.